A grocery guide to help you shop for the ingredients to make the Mexican Street Corn Soup recipe from the Millennial Menu. How this guide works: Ingredients are broken down into approximate location in the grocery store, by order that you'd usually purchase them (produce first, meat second, over to the canned vegetables aisle last). There is also a cost of ingredients scale ranging from $ (very cheap) to $$$$ (extremely expensive - I'm not sure any of my recipes even have an ingredient like this yet). About Millennial Pantry Staples: These are items you should always keep stocked in your fridge or pantry. It will make throwing together a quick dinner easy and simplify grocery shopping. It allows you to purchase food on sale, and all these items are extremely unlikely to go bad before you use them! 1 small yellow onion $ I would be interested to hear how red onion would taste with this - someone try it and let me know! Cilantro $$ [Optional] For topping. Use up the rest in fish tacos or shakshuka. Lime $ [Optional] For topping. Adds a splash of flavor to the dish! 4 cups chicken broth (one carton) $ Millennial Pantry Staple I buy this in boxes since I'm always using it up in another recipe. You can also get smaller portions in cans. Cotija cheese $-$$ Aldi sells a great "queso fresco" cheese that I've decided is an adequate cotija stand in. Sour cream $ You'll need about a half a cup, so buy the smallest carton you see at the store. I use sour cream on anything with lots of spices, like my enchiladas or on fish tacos, so if you have extra, it won't go to waste. Also, it's already sour (ha!) so it lasts forever! 1 bag of Trader Joe's Mexican Style Roasted Corn with Cotija Cheese $$ Substitute: 2 bags of regular TJ's roasted corn (see below) This is the most flavorful addition to the soup, since it comes with the flavor packets to mix in as a strong base. 1 bag of Trader Joe's Roasted Corn$$ Substitute: 2 bags of TJ's mexican style corn (see above) The roasted flavor of the corn really makes a difference, and TJ's makes it easy by having it all ready to go! 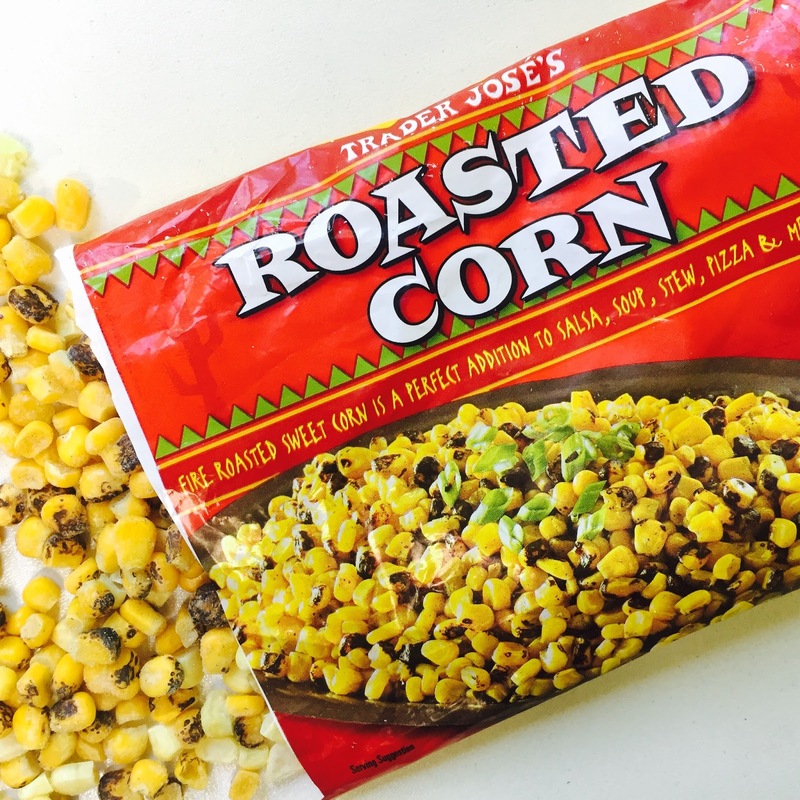 Note: If you don't have a Trader Joe's nearby (I am SO sorry about that), you can create your own roasted corn by buying ~6 cans or so of canned corn and sauteeing it over low heat for 5-10 minutes, until it chars a bit.